This is simple script for renaming and managing objects on the go. 1. Unzip "Quick Manager v1.0.rar"
2. Keep "MyLibrary.mat" to that folder if you are going to keep that folder. If you are going to delete that folder, then put "MyLibrary.mat" to following location - "C:\Program Files\Autodesk\3ds Max 2017\materiallibraries"
1. run "Quick_Manager_1.0.ms" from MAXScipt-Run Script. 2. Then go to Customize-Customize User Interface. 3. Find "Quick_Manager" Under "Sharad Tools"
4. Assign Shortcut for it. A tool used for setting noise controller values on a selection of objects containing position and/or rotation noise animation tracks. - Noise controllers must be added either directly to the main Position or Rotation tracks or setup as a list controller with a single noise in any available list track. - Does not support multiple noise controllers on a single object. Does not support nested list controllers. Does not support noise float tracks on XYZ controllers. A useful tool containing many methods for adding point or dummy helpers to the scene, as well as duplicating existing hierarchies using helpers, or replacing them with a Bones System. - Various methods of helper creation such as: origin, surface, object pivots, picked points, sub-object faces. 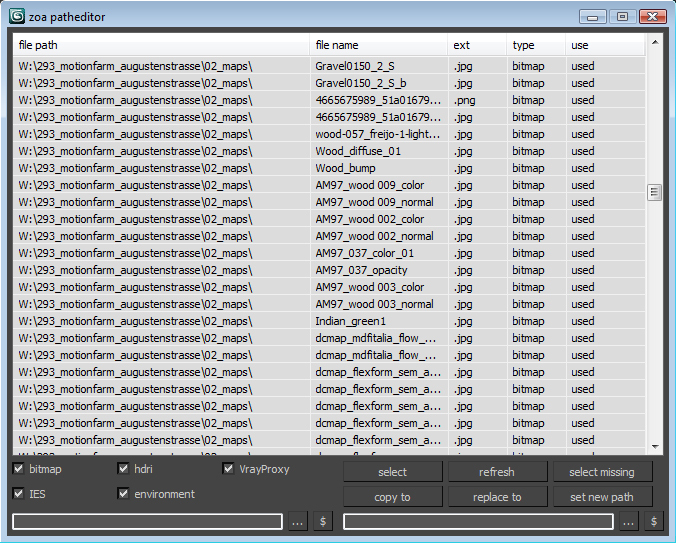 - Ability to add helpers to a selection of objects including; linkage, constraints or baked keys. I'd like to share a script I have made. It's for Vray and it makes a list of all your VrayMtl (and of the main parameters) you have in your scene. A simple tool designed for 3d modelers to save time on exporting multiple objects and to allow them the freedom to continue working in one max file. 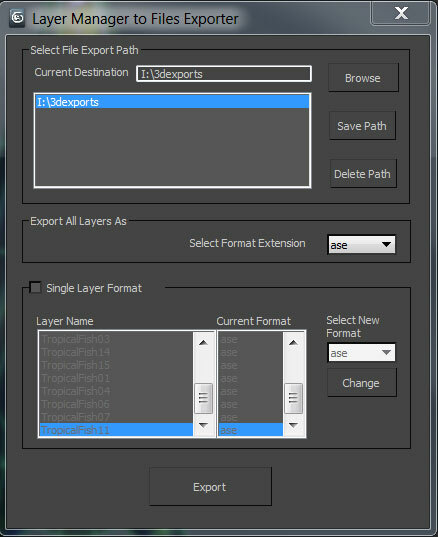 Script allows exporting to the following formats using the layer manager: FBX,OBJ,3DS,ASE, and separate max files. Installing scripts for 3dsMax has never been easier! MaxScriptManager is a tool that will help you keep track of installed scripts, help you install new ones in a number of different ways, get notified if updates are available and even apply updates automatically. Developers can create script repositores so that users can access their script without leaving 3dsMax. FumeFX ModernUI is a tool for 3ds Max that helps reducing repetitive tasks when simulating with FumeFX. It has a clear interface (therefore the name) and comes with an easy to use installer.